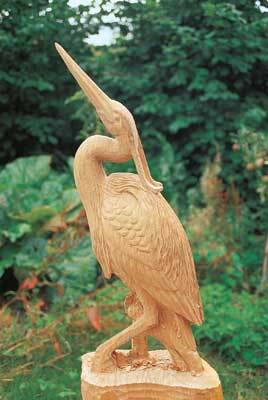 Once you are happy with the general body shape, see last issue, you can start carving the heron's feathers. 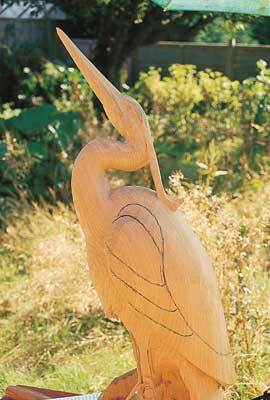 I chose to keep the detail fairly simple, and to carve only the individual feathers where they were largest. This was on the wings and the shaggy-looking feather areas on the back and lower chest. 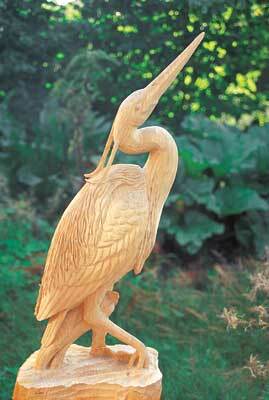 The rest of the feathers on the heron were hinted at by tooling with a shallow gouge. Before you jump straight in and start carving the individual feathers, you will need to mark in the different feather groups, see Feather groupings panel. Draw the edges of the various feather groups onto the wood, then run along these lines with a 13mm (1/2in) No.11 gouge. Using a flat chisel, carefully slant the surface of each feather group so that it appears to slide under the group above it, but don't undercut. Then, using the same flat tool, round off the leading edge of each feather group. Do not worry about sanding this area smooth, as most of the surface will be removed during the process of carving the feathers. Making good use of any photo reference or feather plans, draw in the individual feathers. To maintain a naturalistic look to the finished piece, try to avoid making the feathers all the same size or spacing them too evenly. Carve along these lines with a 6mm (1/4in) No.10 gouge, then treat each individual feather as for the separate feather groups. Using a flat chisel smaller than the one used for carving the feather groupings, slant the surface of each feather so that it appears to tuck under the feather above it. Finally, round off the front or leading edge of each feather. While the above process does sound very easy, I must add that great care should be taken so that the corner of the chisel is not being accidentally jabbed into a surface that you want to keep clean. As far as I know, there is no simple trick to avoid this, it is just a matter of maintaining good tool control. 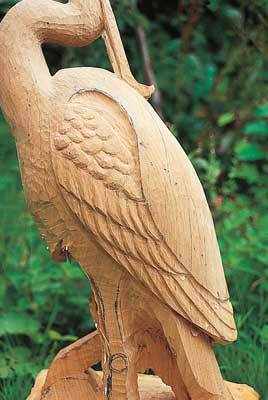 Once the wing feathers have been carved on both sides, you can tackle the shaggy-looking feathers on the back. Mark with your black crayon the general direction in which the feathers flow. 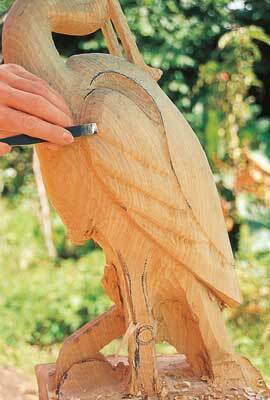 Then, with a 13mm (1/2in) 45 degree V-tool, carve in the larger clumps of feathers with good, bold strokes. To make these feathers look as natural and random as possible: l avoid straight lines; l vary the depth of cut; l try not to cut several lines running parallel for too great a distance. Space out these initial, deep cuts, as you can now carve in between them with a smaller V-tool - or use the same one as before but just work more shallowly. Extend some of the cuts into the deeper V-tool lines to blend the whole lot together. Then, using the scalpel, deepen the odd line here and there, and alter the angles of some of the walls of the V-tool cuts. This can be done by rocking the V-tool from side to side while pushing it through the wood. All this helps to add a random element to the general look. Use the same technique to produce the shagginess on the lower chest. 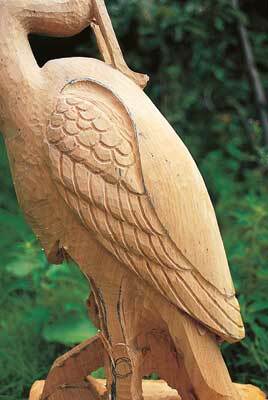 The tail feathers are carved in much the same way as the feathers on the wings. Take note that they are longer - running the full length of the tail - and tuck up under the tips of the wings. If you want to splay these feathers out a bit, some undercutting will be required where one feather fits underneath another. Once again, the scalpel is well suited to this job. Well, you can't put it off forever. It's been nice not worrying about the legs snapping off while working on the rest of the heron, but it's now time to sort them out. Instead of having both legs entering the water close together and straight - which some people may think would be an easier option - I decided to carve mine in a walking attitude. The heron is just lifting the edge of a lily pad as it begins to raise a foot out of the pond. I chose this position not to try and be flash but because it enabled me to spread the base supporting the body by another 152mm (6in) - compared with the legs being close together. This increases the strength in the leg area tremendously. The lily pad contrivance is there purely to add strength to the foot that would otherwise have had just the tips of the toes touching the base. Using the template, mark the position of the legs, along with any reeds you may want for added strength. With a drill, bore through the wood in between the legs, and legs and reed - the wood here is considerably thicker than it was at the nape plume/neck area and it will be asking a bit much to work through it just using a gouge. Once a hole is underway, enlarge it and shape the area with your hand tools, referring to your reference material for details, see Tricky areas panel. When thinning the legs down, be sure to leave enough wood for the slight swelling at the knee joint. The scalpel blade comes in useful for carving around and between the toes of the foot just leaving the water. 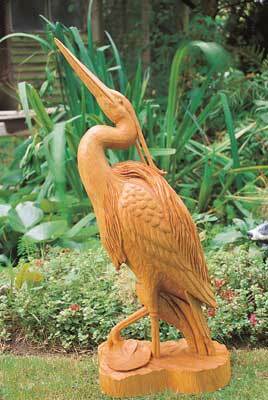 When carving the lily pad I was able to refer to a real one from the garden pond. They rarely seem to lie completely flat on the surface of the water, so curl the edges up and undercut using the scalpel. Inside the pad, the area is fairly concave. Use something like a 13mm (1/2in) No.6 to form the general concavity. Mark with a pencil the fine veins that radiate out from the centre, then run down each side of these lines with something like a 5mm (3/16in) No.11. Curve over the top of each vein using a small, flat chisel - very delicate work this - and finally, using a 10mm (3/8in) No.6, reduce the areas in between the veins. 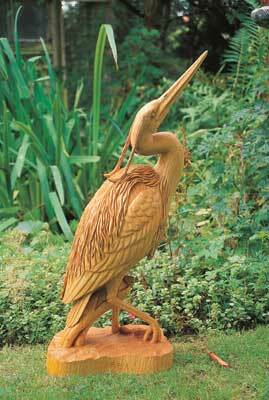 Carve a few ripples in the surface of the water, particularly around the feet of the heron. Form the large ripples first, then tool over the surface with a variety of different-sized gouges to add randomness to the smaller ripples. Only the beak and the eyeballs are sanded. I progressed from 180 grit to 240, then to 320. As I wanted to produce a tooled finish up to these areas, I preferred to complete the sanding first. One careless drag of a piece of sandpaper over a nice, crisp bit of tooling can totally ruin it. 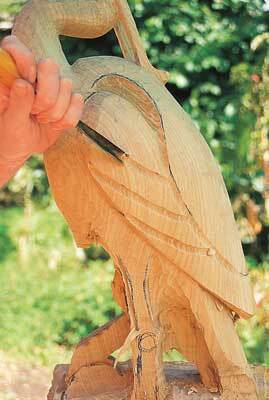 The final bit of tooling is to achieve the feathers on the head, neck and belly. Use shallow gouges of varying sizes - larger on the belly, graduating smaller towards the head - starting at the tail end of the heron and working up the body and neck towards the head. Make sure that each tool mark touches its neighbour's and is made with a single smooth scooping action. Twisting the wrist as the tool is pushed through the wood to create a slicing action with the cutting edge makes the process more efficient. Don't worry about overlaying tool marks just applied. 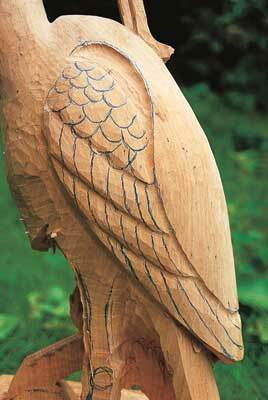 That is why it is best to start at the tail end; the 'feathers' will be overlaying each other in the right direction. Finally, make one last check over the whole carving, to sharpen up any details and clean up any splits or flakes in the tooling. There are many possible ways to apply a finish to seal and protect the wood and to bring out the grain. The method I recommend is to brush on a lavish mount of raw linseed oil, dab off the excess with a cloth, give it a day or so to dry, and repeat the process. Depending on the wood, about four or five applications should be about right. Do not forget the most important area, which is the end grain under the base. The more coats applied the greater the protection, but also the higher the shine and the more detail will get clogged. However, stroking with 0000 grade wire wool can soften unwanted shine. To reduce the chance of premature degradation setting in, the finished sculpture can be positioned on a concrete or paving-stone base rather than directly on grass or earth. Further coats of linseed oil should be applied a couple of times a year, or whenever the wood starts looking thirsty. "One careless drag of a piece of sandpaper over a nice crisp bit of tooling can totally ruin it"
When working in tricky areas, a way of treating the carving that works for me is as follows.